Well loyal visitors to www.wdnicolson.com, you are very lucky to get the most interesting (can't really claim comprehensive anymore but we will declare it the most interesting) NRL preview on the net this week, as the writer is in the midst of a move and quite frankly doesn't think spending good packing time writing up a preview is smart business. But I'll soldier on and deliver some Late Mail and insight that you probably are better served listening to for a while on our newest Podcast - just 53 minutes long with extra GT tips - and thanking me later. Some very tough games on the picking schedule this week... good luck to us all. For more on how we see the Weekend unfolding, check out the Podcast and Preview below. For game-specific Late Mail every week - check back on Friday (or if there's an earlier game, earlier) for all your tipping and fantasy game needs. NOT The Footy Show will release another Podcast next Wednesday night - June 6 with our State of Origin Game 2 and Round 14 Preview Show. Subscribe to the Podcast via this link / Download mp3 version LIKE the show on Facebook for all the latest updates. 1st Prize: NRL Match Steeden Ball. 2nd to 5th: NTFS Club Mascot T-Shirts. All Kick-Offs are LOCAL time. STI +6.0 | GAME STATS | @ Brookvale Oval, Brookvale. 7:35pm Kick-Off. M Spillane and W Nicolson. Follow #NRLTweetPOTY for every Vote in 2012. Sea Eagles are 7-5 and 7th, Dragons are 6-6 and 10th. The Dragons have won 4 straight dating back to late 2010. MAN: B Stewart, M Oldfield, J Lyon (c), D Whare, J Taufua, K Foran, D Cherry-Evans, J King (c), M Ballin, B Kite, A Watmough, D Harrison, G Stewart. Bench: J Buhrer, J Galuvao, D Lussick, G Rose, V Mauro. STI: B Morris, D Vidot, K Stanley, M Cooper, J Nightingale, J Soward, B Hornby (c), D Hunt, M Rein, T Merrin, B Scott, B Creagh, D Young. Bench: N Fien, J Latimore, L Ah Mau, J Marketo, J de Belin, C Stanley. Listen to the Podcast for a full preview, but we like the Sea Eagles. Look Manly might've been dusted by the Panthers last week but the Dragons had all sorts of trouble beating the Eels, take Manly at home..
SMH and Other Late Mail - Kieran Foran should play but Jason King remains in doubt. George Rose could start, while Vic Mauro would come into the 17. Anthony Watmough is expected to play despite a neck injury. The Dragons will choose their bench before kickoff... while Jack de Belin could start for Dean Young. NOT The Footy Show Video is taking a short hiatus - we will be back just not every week. Biggest impact prop in the NRL? NOT The Footy Show reveals which big bopper tops the class in 2012. Get NOT The Footy Show Episode 109 and prepare for moderate entertainment as Warrick Nicolson, DC Chapman and George Taylor take you through the issues of the week and preview Round 13 in full. We talk Matai's slightly flawed defensive 'technique', Are the Broncos in trouble? Can anyone catch Melbourne for the Minor Premiership and Where in the world is Nic McInerney? Also in Episode 109 we delve back into the Feedback Files - so if you want to give us some feedback on Twitter, Facebook or iTunes - feel free to tell us why exactly you listen to NOT The Footy Show? NOT The Footy Show is what the cool kids call... 'gravy' and just 53 minutes long this week. 1st Prize: Your name permanent markered onto our prestigious NTFS Trophy and a NTFS T-Shirt for the Top 3 finishers. 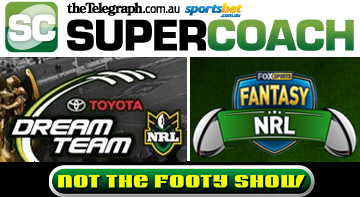 We have two comps running in Dream Team and Super Coach. GLD +3.5 | GAME STATS | @ Skilled Park, Gold Coast. 7:35pm Kick-Off. B Hoese and M Spillane. Follow #NRLTweetPOTY for every Vote in 2012. Titans are 4-7 and 12th, Cowboys are 7-5 and 6th. The Titans won the season opener, while the Cowboys have won 4 of the last 6. GLD: W Zillman, K Gordon, J Idris, B Champion, D Mead, A Sezer, J Rankin, L Bailey (c), M Srama, N Myles, G Bird, M Minichiello, A Harrison. Bench: L Douglas, M White, B Ridge, L O'Dwyer, B Lawrence. NQL: M Bowen, A Graham, B Tate, K Linnett, A Winterstein, J Thurston (c), R Thompson, M Scott (c), A Payne, J Tamou, G Cooper, G Hall, D Johnson. Bench: J Segeyaro, R Thorby, S Bolton, J Taumalolo, C Paterson. Listen to the Podcast for a full preview, but we like the Cowboys. The Titans have played ok lately and are nearly full strength but the Cowboys are capable of blowing them away by 20 here. SMH and Other Late Mail - The Cowboys should be 1-17 unless Cory Paterson is a late inclusion on the bench for Ricky Thorby or Jason Taumalolo, while the Titans are also looking relatively healthy. Little Late Mail to report. CAN +5.5 | GAME STATS | @ Canberra Stadium, Canberra. 5:30pm Kick-Off. G Delaney and W Nicolson. Follow #NRLTweetPOTY for every Vote in 2012. Raiders are 4-7 and 13th, Tigers are 6-5 and 8th. Canberra's win in Round 5 was their first in 8 games against the Tigers. CAN: R Robinson, D Pelo, J Croker, B Ferguson, E Lee, J Dugan, J McCrone, D Shillington (c), T Waddell, T Learoyd-Lahrs, J Papalii, J Thompson, S Fensom. Bench: S Berrigan, J Picker, B Harrison, D Tilse, S Mataora. WTG: T Moltzen, M Utai, B Ryan, C Lawrence, L Tuqiri, B Ayshford, B Marshall, A Woods, R Farah (c), K Galloway, A Blair, L Fulton, C Heighington. Bench: C Sironen, B Murdoch-Masila, M Bell, T Humble. Listen to the Podcast for a full preview, but we like the Tigers... simply put we can't pick the Raiders til David Furner makes a big change to the way Canberra play, right now 'getting fundamentals right' is not going to cut it... what a cop out. Stick with Benji and Robbie Farah - if the latter is concious for the majority of the game. SMH and Other Late Mail - Canberra should be 1-17, while the Tigers will lose Blake Ayshford to a wrist injury with either Chris Lawrence going to five-eighth or Curtis Sironen getting a start. There might also be a Gareth Ellis in the near future... but maybe not this week. Liam Fulton should play. CBY +1.5 | GAME STATS | @ ANZ Stadium, Homebush. 7:30pm Kick-Off. M Tsialis and M Vickers. Follow #NRLTweetPOTY for every Vote in 2012. Bulldogs are 7-5 and 5th, Rabbitohs are 7-4 and 4th. Souths won in Round 6, but Dogs won 3 straight before that. CBY: B Barba, K Inu, J Morris, T Lafai, J Wright, J Reynolds, K Keating, A Tolman, M Ennis (c), S Kasiano, F Pritchard, D Halatau, G Eastwood. Bench: J Graham, D Stagg, C Payne, T Hodkinson, J Romelo, M Taupau, D Finucane. SOU: G Inglis, N Merritt, M King, D Farrell, A Everingham, J Sutton, A Reynolds, L Burgess, I Luke, D Tyrrell, S Burgess, D Taylor, M Crocker. Bench: J Clark, B Lowe, E Pettybourne, S Geddes, C McQueen, J Hunt. Listen to the Podcast for a full preview, but we like the Rabbitohs. Look Greg Eastwood is a vital cog in that Dogs pack, and losing him tips the scales to Souths - although this should be a nice open game of footy to watch..
SMH and Other Late Mail - Eastwood misses and Stagg will start, while Hodkinson could start for Reynolds (or play NSW Cup) and Dale Finucane could force his way onto the bench for his first grade debut. 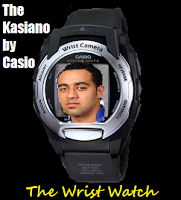 Sam Kasiano's back isn't 100% but he should play. The Bunnies look fit, with only Matt King in any doubt after missing last weekend with a groin strain. WAR +4.0 | GAME STATS | @ Mt Smart Stadium, Auckland. 2:00pm Kick-Off. J Davies and B Hoese. Follow #NRLTweetPOTY for every Vote in 2012. Warriors are 5-6 and 9th, Storm are 10-1 and 1st. Melbourne won in Round 8 but Warriors have won 3 of last 5. WAR: G Fisiiahi, B Tupou, B Henry, K Hurrell, M Vatuvei, J Maloney, S Johnson, R Packer, A Mara, B Matulino, E Taylor, S Mannering (c), F Mateo. Bench: L Brown, Sam Rapira, Sione Lousi, J Lillyman. MEL: B Slater, M Duffie, D Nielsen, W Chambers, J O'Neill, G Widdop, C Cronk, J Bromwich, C Smith (c), J Ryles, R Hinchcliffe, R Hoffman, T Lowrie. Bench: A Quinn, R Kostjasyn, M Greenfield, J Lowe. Listen to the Podcast for a full preview, but we like the Storm in a very very tight one. If Slater misses (the Storm say he will play) then go the Warriors but the premiership front runners are hard to tip against, esp with the Warriors in only solid not impressive form. SMH and Other Late Mail - Kevin Locke might play, and he'd replace Glen Fisiiahi. Michael Greenfield misses with a head knock and Sika Manu or Bryan Norrie could travel to NZ as replacements. NEW +13.5 | GAME STATS | @ Suncorp Stadium, Brisbane. 3:00pm Kick-Off. M McLucas and M Duncan. Follow #NRLTweetPOTY for every Vote in 2012. Broncos are 7-4 and 2nd, Knights are 4-7 and 11th. Brisbane are winners of 3 straight. BRI: J Hoffman, G Beale, J Reed, J Hodges, D Copley, C Norman, P Wallace, B Hannant, A McCullough, P Civoniceva, A Glenn, S Thaiday (c), C Parker. Bench: B Hunt, J McGuire, M Gillett, D Lui. NEW: D Boyd, J McManus, J Sa'u, T Tahu, A Uate, J Mullen, T Roberts, K Snowden, D Buderus (c), W Mason, C Houston, J Edwards, N Costigan. Bench: C Adams, R Fa'aoso, A Cuthbertson, A McKinnon. Listen to the Podcast for a full preview, but we like the Broncos by plenty if they turn up at the right ground. Newcastle might stick with them early but look pointless at the moment, Broncos should turn around their recent losing streak. SMH and Other Late Mail - Broncos should be 1-17, although Ben Te'o could come in late, while the Knights have a doubt over Jarrod Mullen, they could take Matt Hilder to Brisbane as cover. PAR +5.5 | GAME STATS | @ Parramatta Stadium, Parramatta. 7:00pm Kick-Off. N Wilbow and W Nicolson. Follow #NRLTweetPOTY for every Vote in 2012. Eels are 1-10 and 16th, Sharks are 7-4 and 3rd. Sharks have won 6 of the last 8 and won in Round 7 this year. PAR: J Hayne, L Burt, R Morgan, C Blair, K Sio, B Roberts, C Sandow, T Mannah, M Keating, J Poore, N Hindmarsh (c), M Ryan, J Paulo. Bench: R Maitua, FF MoiMoi, M Allgood, T Tautai. CRO: M Wright, I Gordon, B Pomeroy, C Best, N Stapleton, T Carney, J Robson, B Gibbs, I De Gois, B Ross, J Smith, J Bukuya, P Gallen (c). Bench: A Fifita, W Graham, J Morris, M Taufua, S Tagataese. SMH and Other Late Mail - Matt Ryan gets a whole week to rest his sternum, while Reni Maitua comes back at lock. The Sharks will decide between Taufua and Tagataese and you could see Gordon or Stapleton at fullback with Wright or Stewart Mills on the wing instead. 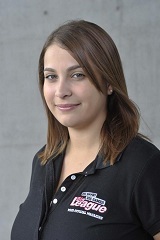 BYES - Panthers and Roosters. This year not only do you get The NRL Tweet's Tips each week but the whole NOT The Footy Show team will have their picks listed by Thursday so you can back a smoky or a favourite by seeing who we all picked (or didn't pick). SPECIAL FRIED RICE involves each tipster taking a 'certainty' in a set order, with the tipster with the highest score at the end of the year literally winning a mountain of Special Fried Rice. Eyes does not eat Special Fried Rice... yet. Make sure you enter NOT The Footy Show's Tipping Competition, the outright winner walks away with an Official Steeden Match ball! 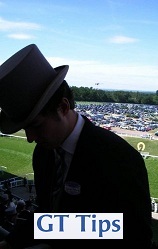 TIPS DONE, GO OUT AND ENJOY THE FOOTY! 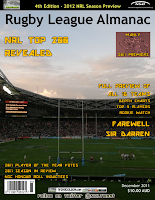 If you want a full 2012 NRL Season Preview you'll need to pick yourself up a copy of the 2012 Rugby League Almanac for just $10.00 - where every team is analysed in depth and our Predicted Ladder and Premiership pick is published. Get The 2012 Rugby League Almanac Now! So while you go grab a copy, here is the short sharp and boldly premature 2012 Prediction for each NRL Club. If you want our Final Ladder - see the Almanac. With our two weekly NRL Podcasts - Subscribe via iTunes here. The show streams live Monday 9:30pm and Wednesday 8pm right here. Podcasts are normally available within a few hours.